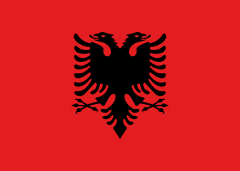 Albanian Americans (Albanian: singular: Shqiptaro-Amerikan / plural: Shqiptaro-Amerikanët) are Americans of full or partial Albanian ancestry. According to data from a 2008 survey by the United States government, there are 201,118 Americans of full or partial Albanian descent. 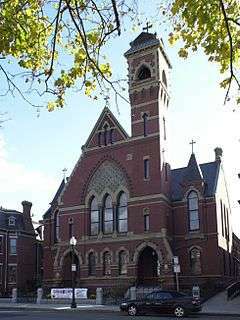 The Albanian Orthodox cathedral of St. George in South Boston MA. The first Albanian documented to have emigrated to the United States was Kolë Kristofori (English: Nicholas Christopher), who landed in Boston in the early 1880s and is remembered as the pioneer of the Albanian ethnic group in the USA. It was not until the 1900s (decade), however, that a large number of Albanians reached the US Eastern Coast: most of them were young bachelors from southern Albania. The majority of this first wave of emigrants, approximatively 10,000, did not intend to permanently settle in the USA, and went back to Albania after World War I. Right at this time, another group of emigrants from Albania reached the USA. This new group settled and intermarried in their new country. The number of Albanians that reported the Albanian language as their mother tongue in 1920 was around 6,000. After World War II the Albanians who emigrated to the USA were mostly political emigrants and by 1970 the figure rose to around 17,000. In the 1990s, many Albanians from Albania, Montenegro, Serbia, and the Republic of Macedonia emigrated to the United States as refugees of war. Another Albanian American (Kosovar Albanian) community in the Riverside, California/San Bernardino area of California includes Kosovars who entered the United States at the March Joint Air Reserve Base in Riverside. Some of the first Ethnic Albanians to arrive in the United States were immigrants from Italy who descended from a group of Albanians known as the Arbëreshe. The Arbëreshe were a group of Albanians who fled to the Kingdom of Naples in the 15th-century to avoid Islamization by the Ottoman Empire. This group of Albanians is distinguishable from other Albanian Americans due to their Italianized names, as well as their either Roman Catholic or Albanian Greek Catholic religion. Nevertheless, Arbëreshe have a strong sense of Identity, and are unique in that they speak an archaic dialect of Tosk Albanian called Arbëresh, which does not have any Ottoman influence. Greater New Orleans has a large Arbëresh community, mostly descended from 19th-century Sicilian immigrants. Oftentimes, wherever there are Italians, there are a few Arbëreshe mixed with them. Arbëreshe Americans, therefore, are often indistinguishable from Italian Americans due to being assimilated into the Italian American Community. 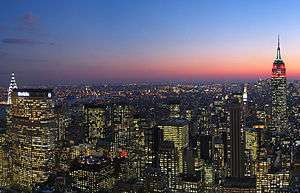 As of 2015, the areas with the largest population of Americans with Albanian descent are New York City, Indianapolis, Northern New Jersey, Philadelphia, Boston, Worcester, Chicago, Detroit, Hartford, and Waterbury, Connecticut. 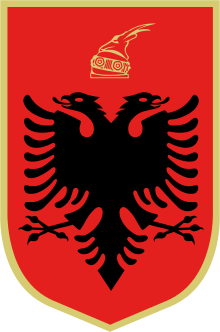 The rapidly growing Albanian population of Lincoln Park, New Jersey, within the New York City Metropolitan Area, is the second largest outside of New York City itself, and is expanding into nearby locations in Passaic County, including Pompton Lakes, Wayne, and Totowa. Additionally, Bergen County is home to an increasing Albanian population, with communities being found in towns including Garfield, Elmwood Park, Hasbrouck Heights, and Fair Lawn. ↑ "1990 Census of Population: Detailed Ancestry Groups for States" (PDF). United States Census Bureau. p. 15. Retrieved 3 December 2015. ↑ "Yearbook of Immigration Statistics: 2011 Supplemental Table 2". U.S. Department of Homeland Security. Retrieved 2012-07-08. ↑ "Yearbook of Immigration Statistics: 2011 Supplemental Table 2". U.S. Department of Homeland Security. Retrieved 2012-07-11. 1 2 3 4 5 6 Thernstrom, Stephan (1980). Harvard encyclopedia of American ethnic groups. p. 24. Retrieved 2010-06-23. 1 2 Vickers, Miranda. The Cham Issue - Where to Now? (PDF). Defence Academy of the United Kingdom. ↑ Chameria Human Rights Association (2009). "Official site of the Chameria Human Rights Association" (in Albanian). Tirana, Albania. Retrieved 2009-03-31.